This is crystal clear by now this whole fiasco was to smear Kavanaugh and control the government by appointing Leftist politicians and getting rid of conservative ones! 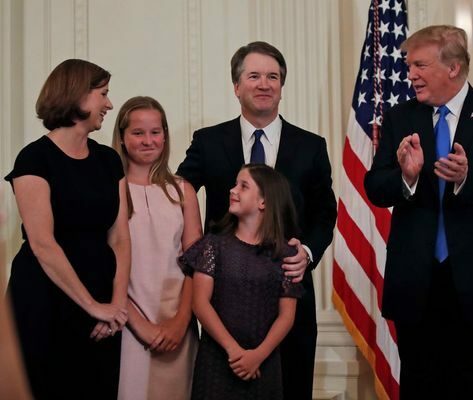 If these women are indeed telling the truth, then the Left is being supreme hypocrites in exploiting them for their own purposes, not giving a voice to women! Just like they don’t care that Kavanaugh’s wife and young daughters were threatened, or women were hurt by Democrats! We need facts, NOT feelings in this chaos that’s unfolding! Christine has the right to be heard, but not the right to be believed with zero scrutiny! The media’s doing a terrible job getting to the facts. The prosecutor they have asking her questions is doing a great job though. The media have no interest in getting to the facts unless the facts convict Kavanaugh. This is a twisted shiv to the back, if I ever saw one. This woman(if you can call her that) just threw her best friend under the bus in one of, if not, the most publicly humiliating way possible. There are so many words that I can think of to describe Ford. This is absolutely appalling! 1. 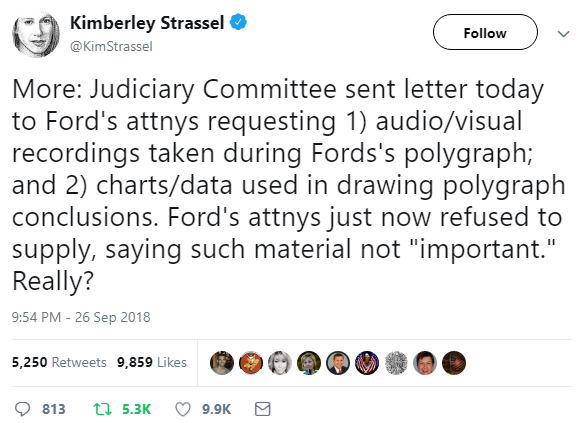 Ford probably was assaulted by someone approx. 36 years ago. 2. Almost certainly it wasn’t Kavanaugh. 3. Having heard NO new evidence today to back up her accusations, the Senate committee should immediately proceed to a vote, preferably tomorrow. 4. The far Left, led by Sen. Dianne Feinstein, has orchestrated this entire smear campaign from the beginning, and are guilty of using and abusing both Dr. Ford AND Judge Kavanaugh. anonymous letter from the committee for SIX WEEKS, until she saw that Kavanaugh’s confirmation was imminent. 6. And finally, VOTE REPUBLICAN IN NOVEMBER!!! It’s fascinating how Leftists saw an entirely different hearing than everyone else. It’s like two alternate universes existing side by side.